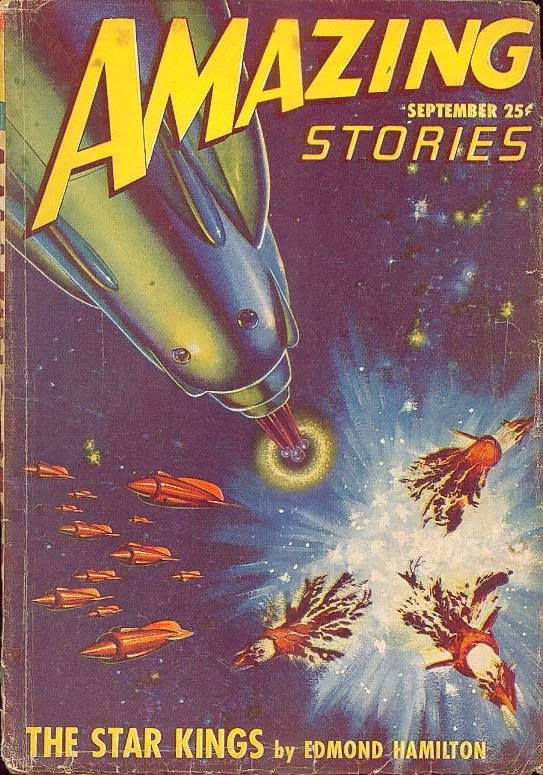 Edmond Hamilton's The Star Kings (first published in Amazing Stories in 1949) is one of the jewels in the crown of early space opera, rivaled only by E. E. Smith's Lensmen Series and Jack Williamson's Legion of Space Saga. 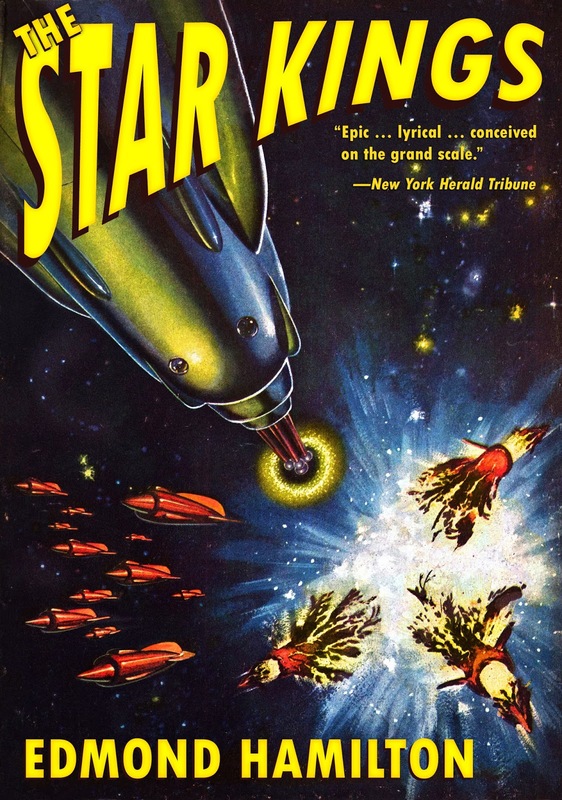 In 1966, in response to continuing reader demand, Hamilton penned a sequel titled Return of the Stars. 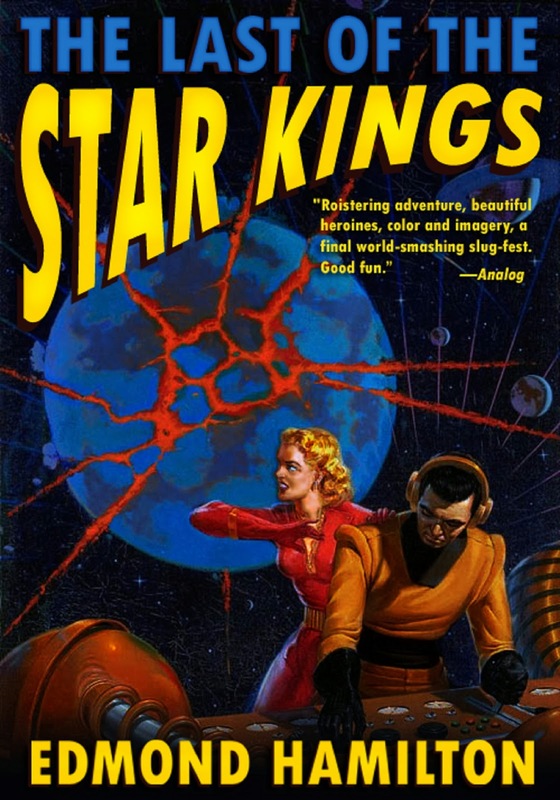 These two novels, along with a short story called Stark and the Star Kings—written in collaboration with his wife, Leigh Brackett—were thought to comprise the entire Star Kings saga. …That is, until earlier this year when the editors of Futures Past Editions discovered, in a series of 1950s digest magazines, two further "complete novels" by Hamilton set in the Star Kings universe. One, The Star Hunter, takes place a few thousand years before the events of the Star Kings. The second, The Tattooed Man, is the capstone of the saga, taking place tens of thousands of years after the era of the Star Kings, when they are a half-forgotten legend believed only by children. 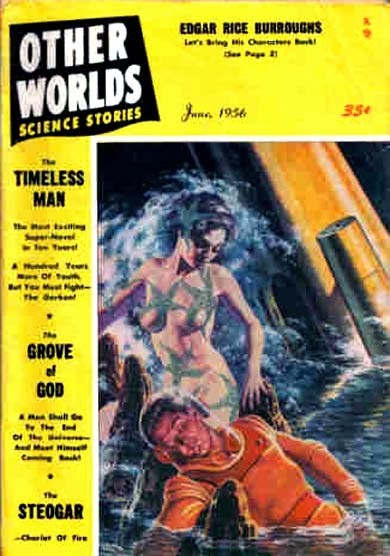 It is possible that this story's connection with The Star Kings was overlooked because it was issued under a pseudonym bestowed by the magazine's publisher. It was identifiable as part of the Star Kings saga only because the climactic scene took place at one of The Star Kings' key locations. The Last of the Star Kings is a Futures Past pulp reprint "Ultimate Edition". In addition to the original magazine text of the story, Ultimate Editions typically feature a new introduction, material by the author about her or his own life or the story itself, the original unaltered magazine cover (or covers), and other special material. The Last of the Star Kings includes these and a very special extended version of Edmond Hamilton's future history (as given in The Star Kings), which covers the two thousand centuries between our own time and that of the Star Kings. (According to an earlier statement by the author, more than half of his science fiction stories are set in this future history, which also includes his famed Captain Future novels). This iteration of his future history charts the events of the millennia which follow The Star Kings, from a long Golden Age through the fall of the star kingdoms and onward to an era when they are almost forgotten and considered only a myth. The Last of the Star Kings will be issued in both ebook and paperback formats. The paperback will be $9.99. FuturesPast Editions are available at Amazon/Kindle, Barnes & Noble, Kobo and iTunes. Futures Past Editions is an imprint of Renaissance eBooks, Inc.
Due to Ray Palmer's championing of the Shaver Mystery by printing it in Amazing Stories when he was editor, and his ballyhooing of several authors and stories in his publication, who did not quite live up to their billing (in the minds of some fans), skepticism, if not incredulity, was rife when he announced when he announced in the pages of his newest publication, Other Worlds, his determination to find a writer who could write in the style of Edgar Rice Burroughs and seek the ERB estate's sanction to have him write authorized sequels to the Tarzan and John Carter of Barsoom stories. In part, Palmer felt confident he could do so, as he knew the Burroughs' heirs from the days in the 1940s when he had commissioned Burroughs to write what became the last ERB John Carter novel, Llana of Gathol, as well as new adventures of David Innis in Pelucidar and Carson Napier Venus. Could anyone really emulate Burroughs' inimitable style? And who would the author be? Inquiring, and disbelieving, fans wanted to know. Some even believed, based on the quality of Palmer's own homage to Tarzan, the Toka, King of the Dinosaurs series, that the author he had in mind was none other than himself! When the famous author of Tarzan, and John Carter of Mars, and all the other wonderful characters the whole world has come to know and love passed from this earthly scene, we lost more than we want to lose. Must these wonderful characters die too, because their creator is gone? Decidedly no! say thousands of Other Worlds readers. And now, something is being done about it—and you can take part! Three things are necessary, to achieve the goal of this greatest of all science fiction fan projects: First, a writer who can recreate the wonderful realism of these historic characters. Second, the writing of these stories. Third, the permission and cooperation of the present owners of the copyright and title to the Edgar Rice Burroughs characters. The first condition has been fulfilled in the person of John Bloodstone, whose wonderful stories have thrilled thousands, and whose life ambition is to fill the shoes of the writer he has admired and emulated since 1917. Here is a man whose already published works number in the millions of words, and whose ability is unquestioned. written a John Carter-Tarzan novel which he calls Tarzan on Mars, totaling 110,000 words, purely to demonstrate his remarkable qualifications for the honor of being named the logical successor to Edgar Rice Burroughs. On the word of such renowned science fiction experts as Forrest J. Ackerman, Ray Bradbury, Everett E. Evans, and your own editor (to mention just a few), this is a sensational story, truly proof that John Bloodstone is the new Burroughs. Could any greater tribute to a great writer be paid than this tremendous effort on the part of John Bloodstone? No mere proposition here, but an established fact, a monumental work, a terrific novel! The third condition seems to us to be the most simple of all. 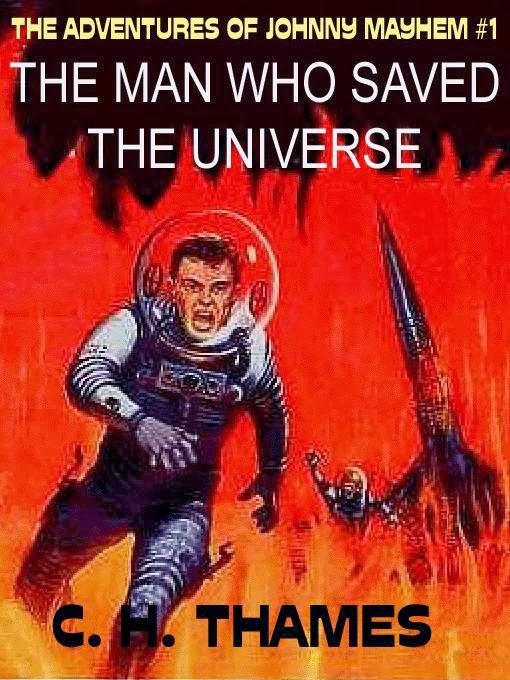 To appoint a legal successor to write more adventures of the greatest science fiction characters of all time is but a reasonable reaction to the heartfelt wishes of many, many thousands of readers, who pledge their perpetual loyalty. The demand exists, as this magazine is ready to prove. 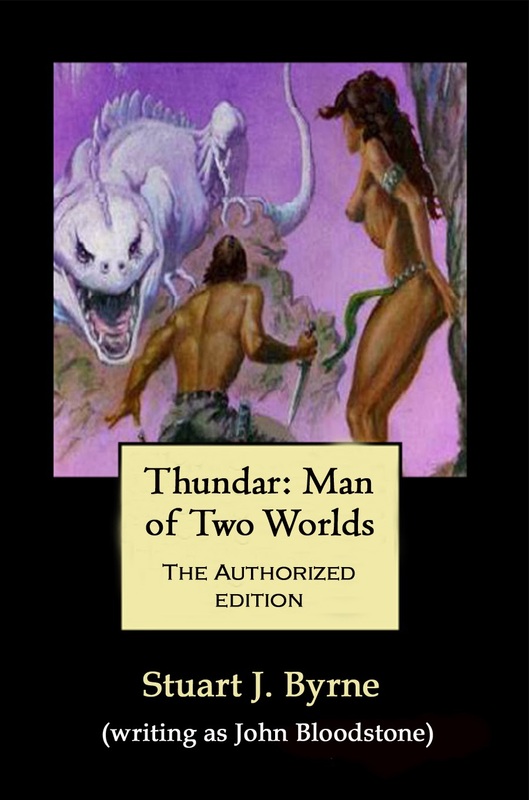 Your editor hereby humbly requests that the Edgar Rice Burroughs, Inc., of Tarzana, California, appoint John Bloodstone to write more stories in the Burroughs tradition, and that they begin by authorizing the publication of Tarzan on Mars. Let's Bring John Carter Back To Life! And say: Appoint John Bloodstone to be legal successor to Edgar Rice Burroughs! Next in our recounting of this fannish cause celebre, fandom's response from the letter columns of Other Worlds. You can see free for yourself whether Byrne was a fitting successor to Edgar Rice Burroughs. Visit our Stuart J. Byrne page - just click on The Land Beyond the Lens, the first volume in his Burroughs-inspired Michael Flannigan trilogy, select the Buy tab and it will take you to a location where you can download the book free for kindle or epub. 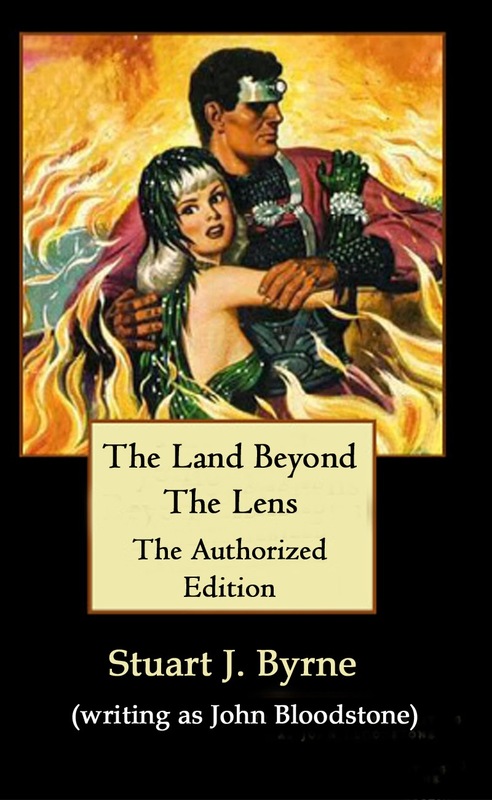 GET LAND BEYOND THE LENS FREE HERE! Visit Futures Past Editions' New Website – We're Giving Everyone 14 Free eBooks! A pioneer publisher of classic and contemporary science fiction, fantasy and horror in ebook and paperback since 1998, Futures Past Editions is excite to announce the launch of its new and improved website at FuturesPastEditions.com. FuturesPastEditions.com features a beautiful header created by Valerie Tibbs and extraordinary visual design by Frankie Hill. Raves for their work have been pouring in. The new site features links to all available titles, searchable by genre and author; a free books page; comic book and graphic novel releases; the Futures Past Editions blog and more. To celebrate, Futures Past Editions is making 14 full-length ebooks available to everyone who visits the new site. Just click here FuturesPastEditions.com – then select the Free Books tab below our banner. When you see books that look interesting on the Free Books pages, click their Buy tab and you will find links for downloading each ebook free in kindle and epub. Select titles are also being made available in premier print editions. — and many, many others! If you would like to be added to the Futures Past Editions mailing list to receive their periodic newsletter and/or review copies or to opt out of our press contact list, please email Associate Publisher M. Christian at mchristian@renaissanceebooks.com. 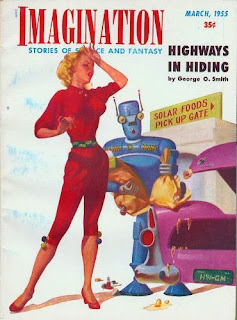 After Isaac Asimov's response in the fanzine Peon to what he, fairly, perceived as book reviewer Henry Botts' personal attacks rather than legitimate criticisms in his column in the science fiction pulp magazine, Imagination, both Bott and Imagination's publisher William L. Hamling, leapt back into the fray with a riposte in an editorial the March 1955 issue. One of the regular departments in Madge is our "Science Fiction Library", in which each month Henry Bott reviews one or more of the current crop of science fiction books. This department renders a service to the reader in that it provides a critical review — complimentary or otherwise — upon which a reader may base his decision to purchase and read the books reviewed. From the book publisher's and author's position it provides free publicity for their wares. Those who review books are necessarily placed in a unique position; they are applauded by some, denounced by others — depending upon the opinions of the person who agrees or disagrees with the reviewer. For this reason reviewers of science fiction books should be chosen with an eye toward their background and/or qualifications. equipment corporations. From technical and literary aspects Mr. Bott fills our book of qualifications for a science fiction critic-reviewer. We have elaborated in this regard because one science fiction writer who has had several of his books reviewed by Mr. Bott unfavorably — has felt piqued to the point of first questioning the identity of our reviewer in correspondence to this office, and later with a public protest of the reviews he has "suffered" in one of science fiction fandom's publications, Peon. The writer in question is Isaac Asimov. In his public protest Mr. Asimov accuses Henry Bott (referring to him as "The Nameless One") of indulging in personal insult, and not being bound to accuracy and fact. Mr. Asimov further berates Mr. Bott as being a critic who substitutes invective for reasoning and personalities for analysis. Mr. Asimov also includes in his protest the lectural point that a reviewer ought not to imply that no one likes the book being reviewed, especially since the record indicates that thousands of copies were sold. For those interested in reading the full account of Mr. Asimov's protest, we feel sure copies can be obtained by writing to the editor of Peon, Charles Lee Riddle, 108 Dunham St., Norwich Connecticut. Listed price of the publication is 10 cents. It is not our intention to attempt to prove that any book review given in our pages is necessarily gospel word on the subject, inasmuch as opinions differ. We do however take exception to a writer's attempts to nullify the effect (in his mind) of an unfavorable review by condemning the reviewer with untrue remarks. I am grieved that Mr. Asimov is perturbed about my dislike of his books. Ordinarily this would not disturb me greatly; a natural rancor must exist between author and critic. Mr. Asimov takes me to task, as the "Nameless One" for identifying the author with the book, and criticizing the former, not the latter. This accusation prompts me to reply to his criticism of a critic. I do not know Mr. Asimov. I know he has written numerous books. .1 have heard they have sold well. I know that many critics have praised his books. I do not dislike Mr. Asimov. I have read most of his books. I do not like his books. I do not think they are well-written, interesting, or worth bothering about. As a critic it is my privilege to say so. Mr. Asimov is determined to force me to admit that his books are "good" even though we probably do not even agree on a definition for "good". Mr. Asimov, if the criterion of quality is necessarily measured by the number of sales, comic books would be "good", the Spillane material would be great, and. the vast majority of paperbacks would be magnificent. However, I do not concede that the interests or purchases of ten million morons indicates that makes those interests or purchases "good". By the same 'reckoning, the fact that thousands of your books have been purchased cannot make me believe your books are well-written. To paraphrase an epigram: "There is no such thing as a good or bad book. Books are well-written, or badly written. That is all." In my opinion, Mr. Asimov, your books are badly written. If I think that, as a critic, it is my duty to say so. Meanwhile check out our new website at FuturesPastEditions.com. Get 10 classic pulp magazine novels free in Kindle and at iTunes. Japan. 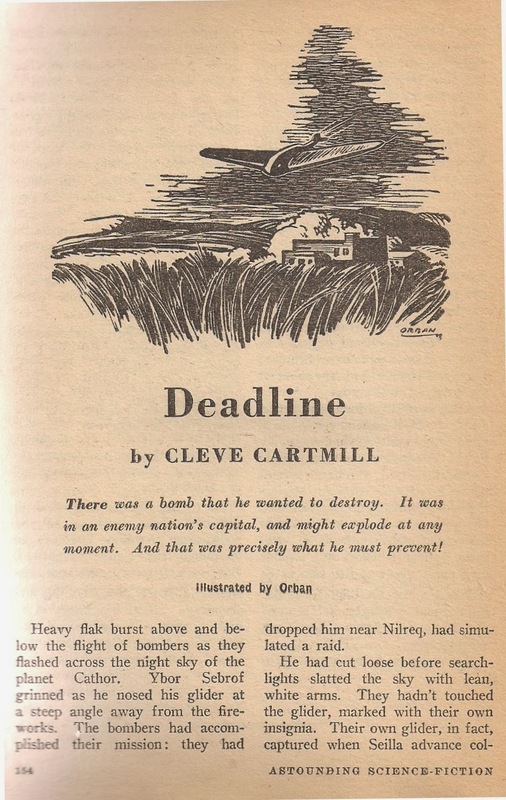 In "Deadline", the story in question, Cartmill had simply reworked a passage from one the many articles on nuclear physics and chain reactions openly published in the technical journals of the period and available in libraries throughout the U.S.A. The government's most closely guarded secret, in short, was known to every professional in the field, and if the Germans had wanted to know how to construct an atomic bomb, all they would have had to do was subscribe to those journals (which, it turns out, is just what they did to help advance their own atomic bomb program). "DETONATION AND ASSEMBLY. As stated in Chapter II, it is impossible to prevent a chain reaction from occurring when the size exceeds the critical size. For there are always enough neutrons (from cosmic rays, from spontaneous fission reactions, or from alpha-particle-induced reactions in impurities) to initiate the chain. 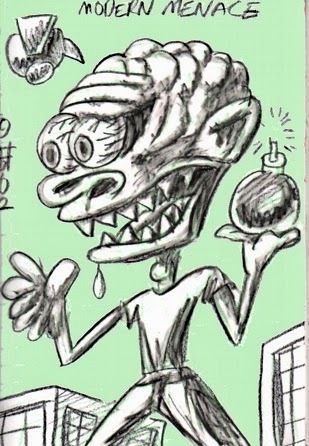 Thus until detonation is desired, the bomb must consist of a number of separate pieces each one of which is below the critical size either by reason of small size or unfavorable shape. To produce detonation, the parts of the bomb must be brought together rapidly. In the course of this assembly process the chain reaction is likely to start–because of the presence of stray neutrons–before the bomb has reached its most compact (most reactive) form. Thereupon the explosion tends to prevent the bomb from reaching that most compact form. Thus it may turn out that the explosion is so inefficient as to be relatively useless. The problem, therefore, is two-fold: (1) to reduce the time of assembly to a minimum; and (2) to reduce the number of stray (predetonation) neutrons to a minimum." You can compare this passage with the way Cartmill describes the same phenomenon by reading his story in our book Deadline and Other Controversial SF Classics..
After a few more interviews with the astonished Robert A. Heinlein, Isaac Asimov, L. Sprague de Camp, and Murray Leinster, the FBI wrote an end to its investigation, clearing all concerned, and turned to what surely must have been weightier matters. It ought to be noted, in fairness to Cartmill, that if any government or bureaucracy were to properly understand his stories, they would find them all controversial and dangerous. For Cartmill questioned authority, and traditional explanations of things, and tried to tell his stories in such a way that the reader would begin to see their shortcomings in her or his own society and start to question them, too. So be warned, if you are completely comfortable with the people in charge and way things are now, and never want to doubt them, put down this book immediately and do not read any further.